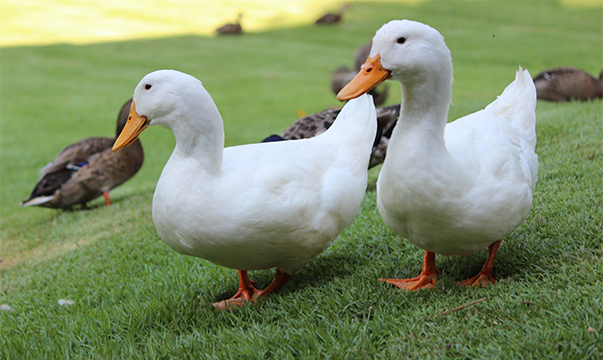 Chester the Duck, right, was treated for a puncture wound in his esophagus. He has fully recovered and is shown here with his pal, Dipsey, enjoying his lake-living lifestyle once again. 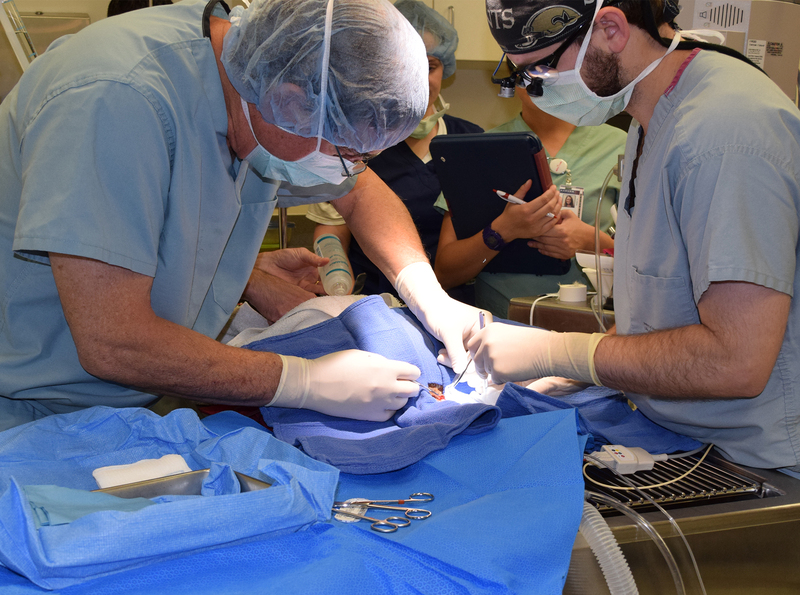 It is not every day that surgeons and clinicians perform a medical procedure on a pet duck at Auburn University’s College of Veterinary Medicine, but in the case of Chester, a 1-year-old white domestic neighborhood duck from Newnan, Ga., their work successfully returned the webbed-footed wonder to a normal lake-living lifestyle. 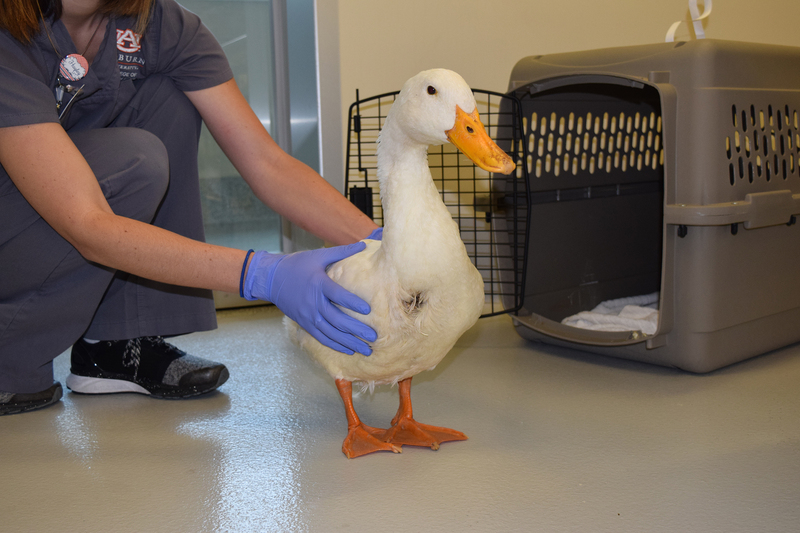 Known as “Chester Schulz” in his medical records, the injured duck was brought to the college’s avian veterinarian when concerned residents near a 300-acre lake where Chester lives noticed an apparent wound at the base of his neck. Chester was brought to the CVM for treatment and surgery to repair a puncture wound in his esophagus. Chester was examined by Dr. Seth Oster, an assistant professor in the Department of Clinical Sciences and the college’s avian veterinarian in the Wilford and Kate Bailey Small Animal Teaching Hospital. Chester undergoes surgery at the Wilford and Kate Bailey Small Animal Teaching Hospital to repair a puncture wound in his esophagus. He has fully recovered and is once again enjoying life on his Newnan, Ga. neighborhood lake. Dr. Oster said that the wound had begun to heal, but not in a normal manner. Dr. Oster consulted his colleague, Dr. Harry Boothe, a professor in the Department of Clinical Sciences and a soft tissue surgeon. Dr. Booth agreed the surgical procedure was needed to restore Chester to normal healing. During a 45-minute procedure, Dr. Boothe successfully separated the skin tissue from the esophagus and closed the neck wound. Chester recovered and was returned to Schulz and his concerned neighbors. Following two weeks of isolation and loving care, the duck has been given a clean bill of health and allowed to return to his waddling pals in the lake. Neither Schulz nor the veterinarians know exactly how Chester was injured. They speculate that it may have been caused by a protruding nail or other sharp object on the lake’s seawall. “We have inspected the seawall, but as of yet, we have not found anything that looks like it might have punctured Chester’s neck,” Schulz said. “We see this type of injury among raptors in the wild, who are injured fighting, but it is pretty uncommon to see an injury like this in a duck,” Dr. Oster said. Schulz said he is most pleased with the care and treatment Chester received at Auburn.